Epson Stylus Photo R300 is a multifunctional printer for home users. It is capable of delivering high-quality outputs for printing, copying, and scanning. The inkjet printer offers many useful features for home and small office users like CD/DVD printing, direct printing, PictBridge ports for digital camera, memory card reader, Bluetooth and good paper handling etc. The printer weighs approximately 6.3kg and measures 19.6 x 10.4 x 8.6 inches. It has a flatbed scanner and a small display screen along with the button control panel. The printer has two different input trays for paper (120-sheet capacity) and CD/DVDs feed. There is one telescopic output tray at the front of the device. Just next to the paper output tray, at the front bottom of the printer, memory card, USB, and PictBridge ports are situated. The printer uses high-quality Epson Stylus Photo R300 inks that produce great prints on a variety of media. The Epson Stylus Photo R300 is an all-in-one printing device for home and small office users. 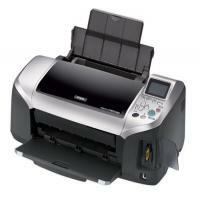 It is capable of handle multi-media printing and delivers very high-quality prints. It is a low-cost device, however, its running cost is slightly higher. It uses 6 ink cartridges, if one runs out of ink, it does not function. These cartridges are also available in T0487 Multipack (Epson Stylus Photo R300 multipack) that offers you great saving on ink expenses. How to resolve missing colour and/or black printout issue in Epson Photo R300 printer? When your printouts are missing colours or black texts or images, there can be many reasons behind the situation. It can either be caused by a clogged printhead or by an old EPSON STYLUS PHOTO R300 ink cartridge. Whatever the cause may, the issue can be resolved by following some simple steps. Many times the blocked nozzles of printhead affect the printout quality by preventing colour ink to properly spread on the paper. The issue can resolved by running an automatic printhead clean up process on the printer. Once the printer finishes the cleanup process, try out a print test. If the printout copy comes fine you can stop the process. If it does not come completely fine but shows an improvement you can continue the cleanup until the satisfied results come out. If the cleanup process shows no sign of improvement even after running the process for 5 times, then you need to proceed to the next step. Ink cartridges older the 6 months can dry out, even a few months old cartridge can also dry out if not used regularly. If one of these is your case you need to replace your ink cartridges and run a test print. Replacing the cartridge would surely resolve the issue. Q. What does the message “ink low” indicate? What should I do to resolve the message? A. The ink low message indicates that either the black or coloured EPSON STYLUS PHOTO R300 ink cartridge is almost empty and needs replacement. To identify which ink cartridge (black or coloured) is empty, check the ink levels using the EPSON status monitor. Q. What if all the products, including EPSON STYLUS PHOTO R300 ink cartridges, that I ordered from your site are not delivered on an expected date? A. It is an extremely unlikely event in which not all items of your order are received by you. In such case, you need to inform us within 24hrs of receipt of the products. Unfortunately, after that, we won’t be liable to accept any claims. Please contact us at 048 30833221 or email us at info@printerinkcartridges.ie for more information. Q. What is the time period for returning a non-faulty item back to you? A. If an item fails to operate, you can return an undamaged product in its original packaging within 7 days of cancellation of the product. We’ll place a replacement or refund a money back once the item has been returned to us and found non-faulty after testing. Q. How many individual EPSON STYLUS PHOTO R300 ink cartridge slots are there in this printer? A. There are no individual cartridge slots available in this printer. Q. How many input trays are available in this printer? What is the total media capacity? A. The printer includes two different input trays for paper. The total media capacity of this printer is 120 sheet. Q. Which media types are supported by this printer? A. The printer supports following media types: bond paper, envelopes, glossy photo paper, greeting cards, heavy-weight matte paper, matte paper, photo paper, photo stickers, plain paper, semi-gloss paper and transparencies. Q. Is there any correct order to replace the ink cartridges for the Epson Stylus Photo R300 printer? A. There is no particular order for replacing Epson Stylus Photo R300 ink cartridges. You are required to replace the Epson Stylus Photo R300 ink cartridges as and when they run out. As long as you have inserted the cartridges correctly, the order in which you have installed them usually does not matter. Q. Do the compatible inks for the Epson Stylus Photo R300 printer give long-lasting photo results? I want to use the printouts for professional use. A. All our compatible Epson Stylus Photo R300 ink cartridges have been strictly tested and will deliver very impressive results in terms of image quality and durability. You can also try them risk free because we give 100% money back guarantee on them. Our returns policy allows you to claim your money back if you are not fully satisfied with them. Q. My printer is printing blank pages from Windows or my Mac. What should I do to resolve this? Ensure that your printer is selected in the Print window (Windows) or in the Page Setup and Print windows (Mac OS X), or is the active printer in the Chooser (Mac OS 8.6 to 9.x). Your document may have more pages than you print. Select Print Preview from your application's File menu before printing. Now, either select to print only the current page, or only those pages with text, or delete the extra pages in your document and then print. Paper settings in the printer software may be incorrect for your paper size. Check the paper size, orientation, printable area, and layout settings to make sure they're correct for your paper size. If still the problem is not solved then the print head nozzles may be clogged. Clean the printhead and run a nozzle check. Please refer the user manual for step by step instructions. Q. I own an instant photo booth where I print photos for my customers on the go. The ink of the printer I use i.e EPSON STYLUS PHOTO R300, gets exhausted very fast. This costs me a lot and causes inconvenience while printing. What should I do as to resolve this issue? A. For extensive usage as of yours, we provide multipack of EPSON STYLUS PHOTO R300 ink cartridges containing 30 cartridges. Our compatible multipacks are extremely cost efficient and saves on money while delivering excellent quality prints. It is always advisable to use compatible version of cartridges that we offer over originals. You can order the same from the following link: https://printerinkcartridges.ie/multi-saver-pack-t0487-24-4-free-black. The quality of prints and efficiency of cartridges will be at par with the original cartridges. Q. Can you provide me a list of cartridges compatible with EPSON STYLUS PHOTO R300? Q. All the Epson printer cartridge slots appear to be same in size. Can I use EPSON STYLUS PHOTO R300 ink cartridges with any Epson printer? A. No, a cartridge works with a group of printers only which we always make sure to enlist on our website. These EPSON R300 ink cartridges are not compatible with all Epson printers. You should never use cartridge since it fits in the slots. The EPSON STYLUS PHOTO R300 ink cartridges are compatible with the following printers: Epson Stylus Photo R200, Epson Stylus Photo R210, Epson Stylus Photo R220, Epson Stylus Photo R300, Epson Stylus Photo R310, Epson Stylus Photo R320, Epson Stylus Photo R330, Epson Stylus Photo R340, Epson Stylus Photo R350, Epson Stylus Photo R300M, Epson Stylus Photo RX300, Epson Stylus Photo RX320, Epson Stylus Photo RX500, Epson Stylus Photo RX600, Epson Stylus Photo RX620, Epson Stylus Photo RX640. It is advisable to check before using the cartridge with printer to ensure compatibility . Q. What is the quantity of ink in original and non Epson EPSON STYLUS PHOTO R300 ink cartridges? A. Both the cartridges original and compatible have 13mL ink in each of its colour cartridges. Q. Does the EPSON STYLUS PHOTO R300 printer require a PC connection for printing photos? A. The printer has pictbridge port for connecting camera directly to the printer without actually connecting the printer to the PC. Also, you can print using a memory card and inserting in the memory card slot provided. You can also Print from Bluetooth capable PDAs, laptops and mobile camera-phones via an optional adapter. The printer has an interactive LCD screen to manage photos and print. This makes it easy to browse photos without a PC. Q. I have a EPSON STYLUS PHOTO R300. I am facing problems while recognizing the compatible ink cartridges by the printer. If I try your cartridge, will it work fine and what if it does not work? A. Our compatible EPSON STYLUS PHOTO R300 ink cartridges are guaranteed to work with the compatible printer models as listed on the following web page: https://printerinkcartridges.ie/epson-inkjet-cartridges/epson-stylus-photo/stylus-photo-r300. It may happen at first the cartridge may not be recognized by your printer, but you can contact us and we will try to troubleshoot and make it work for you. We also offer a 30-day return policy in case you are not satisfied with the product or if there is any issue or fault in the cartridge. Either way, we will replace your cartridge with the new one or will refund you the money.